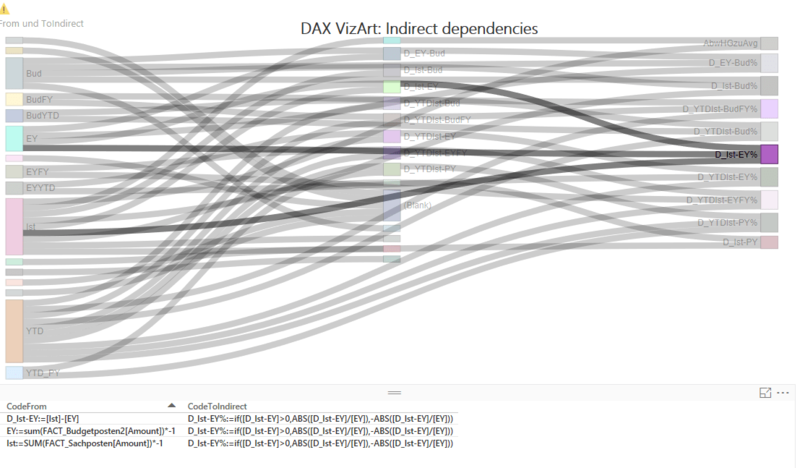 This DAX-VizArt-Wizard vizualizes dependencies between your DAX measures, shows the definition of all related measures and shows differences between the measures of 2 models/versions. This works for Power Pivot, Power BI and for Analysis Services Tabular (SSAS). In the second version, all indirect connections will be highlighted as well & the selected measure definitions will be shown. So how to handle these tools? 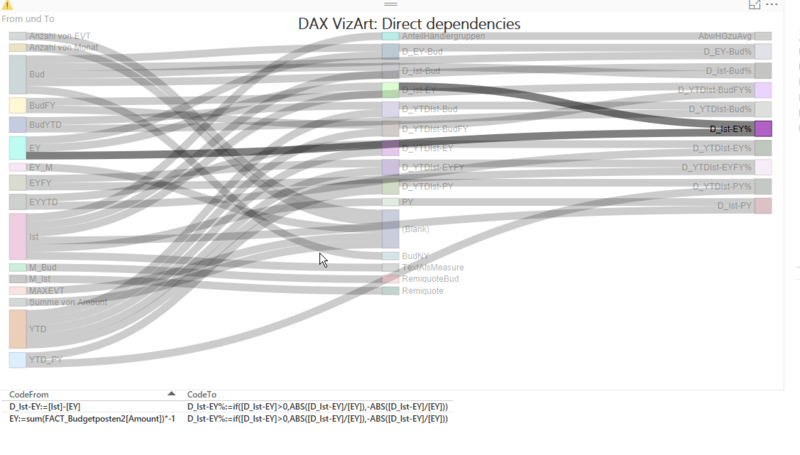 If you haven’t done already, download the sankey diagram from the Power BI Visuals Gallery. 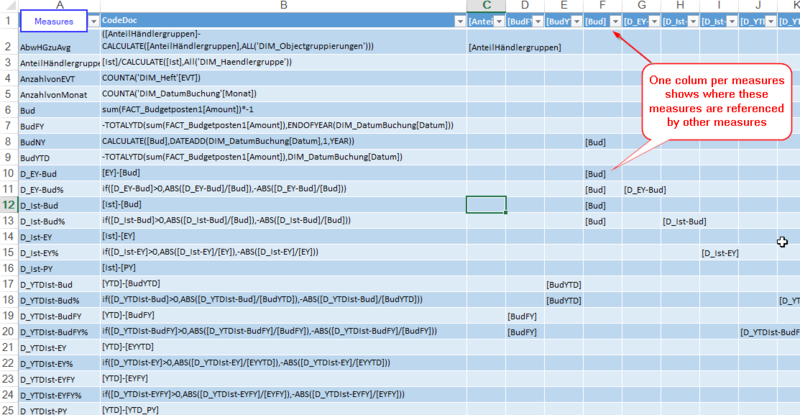 Reference this sheet from your file or copy the whole table into the Excel-sheet “DAX” (like I did in the example files). Compare versions: In sheet “DAX_Version2” you can fill in the table from a previous version of your model and then sheet “VersionComparison” will give you all measures that have been changed, deleted or added (after the refresh). The blue “Analyse”-sheets give you some table outputs for analysing your measures with respect to their relations under each other if you don’t like the graphical form. 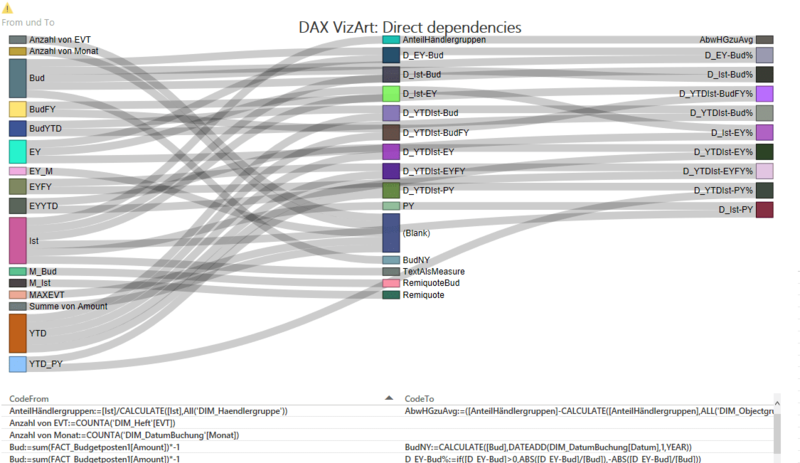 Please tell me what you think of this DAX-VizArt-Wizard: Do you find this useful? Where would you use it for? Any ideas for improvement? Edit 6th April 2016: Gerhard Brückl found a different way to accomplish the query for the chart here. Using DMV’s that also consider calculated columns! I have to agree with Andreas, I want to like the Sankey visual for the “coolness” factor, but I find the tables easier to use. That may change once I try it interactively. Is there any option to allow the lines within the Sankey visual to be colored? I think that would greatly help avoid blending effect when looking at the overall picture (I would imagine it is cleaner when selecting sections in the visual itself). No, not aware of coloring options. Some improvements coming in the new Sankey with labels (https://app.powerbi.com/visuals/show/Sankey1452239004508), as you can drag the items in order to improve readability. But the disadvantage there is that the “dragged layout” doesn’t stick.